Bathtubs and showers can function as daily oases for respite and relaxation, and thus warrant very careful selection. Find the perfect bathtubs and showers for your next project through Architizer’s community marketplace for building-products. Click here for more information. It’s free for architects. As everyday objects that are integral to daily life, bathtubs and showers can often be taken for granted as design objects. However, when well detailed, they serve as vital daily oases for respite and relaxation, and thus warrant very careful selection. To uncover all the key considerations for integrating bathtubs and showers into your next design, we spoke with Jeremy Cressman and Kimberly Versaw of Lixil Water Technology Americas. Today, Lixil oversees a portfolio of renowned bathroom brands including American Standard, Grohe and DXV. With bathtubs and showers, “we like to start working with an architect as early on as possible,” Cressman said. However, in reality, the timeline that unfolds depends on the typology of the project at hand. “With residential, multi-family apartments and hotels, our products are included as part of the interiors package during the design concept stage. All of the fixtures, fittings and systems are then validated by a plumbing engineer. “Selecting a bathtub is an extremely important decision. This is because of the amount of space that it consumes and the materials that it uses. Certain parts of a bathtub must be installed very early on, before the room is even finished,” Cressman said. Alcove Bathtubs: Often harnessed as a tub and shower combination, alcoves are the simplest and most common models to buy and install. Alcove bathtubs fit into a three-walled enclosure, which makes them a great choice if you are trying to optimize space. The front side is then finished using an integral tub apron. The standard length for an alcove tub is 60-inches, however, models range anywhere from 53 to 72-inches. Drop-In Bathtubs: Sometimes referred to as undermount or deck-mounted bathtubs, drop-in tubs sit within a built up structure or platform. Providing plenty of design flexibility, American Standard manufactures drop-in bathtubs in four shapes: corner, hour glass, oval and rectangle. Like free-standing tubs, drop-in bathtubs can be installed in the middle of a room and do not require the three-walled enclosures that surround alcoves. As a result, depending on your design specifications, drop-in bathtubs can require more floor space than alcoves. 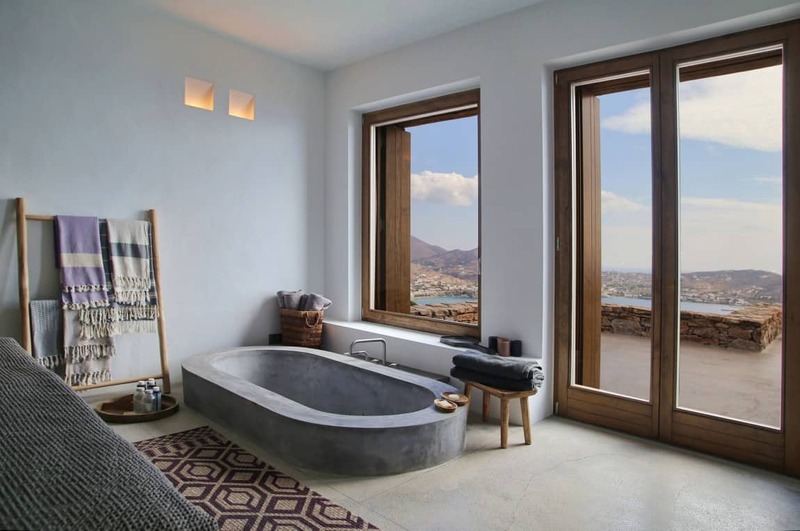 Freestanding Bathtubs: Sometimes referred to as soaking bathtubs, freestanding bathtubs are stand-alone tubs that are completely disconnected from surrounding walls, surfaces and adjacent support structures. These tubs can be a beautiful design statement and focal point of a room. However, in the majority of cases they must be accommodated with a 360-degree clearance, and thus require a fairly spacious bathroom. DXV offers an extensive line of luxury soaking bathtubs. The main challenge associated with integrating a freestanding tub is identifying exactly what to do with the exposed plumbing. One of the most common approaches is to purchase specialty faucets and fixtures, and celebrate them rather than trying to hide them. “DXV has a line of tub fillers that look almost like antique telephones,” Cressman said. In addition, American Standard manufactures freestanding tub drains and tub fillers in a variety of elegant finishes and shape. Sunken Bathtubs: Reminiscent of outdoor swimming pools and spas, a sunken bath is dropped into the floor rather than extruding from or being mounted on top of it. The outer profile of the tub is completely hidden, meaning that only the rim is left exposed. For further inspiration on sunken bathtubs, check out Architizer’s collection, Submerged: 9 Sunken Baths Carved Out For Relaxation. Electric Showers: By drawing on a cold water supply and using an integrated element to heat it on demand, electric showers do not require large, readily available stores of hot water and are thus not reliant on a central heating system. As a result, they are highly energy efficient. The main downside is that the flow rates of electric shower can be very low. However, choosing an electric shower with a higher kilowatt rating will allow for better flow performance. Mixer Showers: Just as the name suggests, mixer showers blend hot and cold water together in order to create an optimal temperature. Mixer showers must be directly connected to both the hot and cold water supply of a building. On average, mixer showers offer much higher flow rates than electric showers. Power Showers: Similar to an electric shower, power showers heat cold water based on demand. The main difference is that power showers include an integrated pump to boost the flow rate. It is important to keep in mind that power showers typically use 3-5 times more water than electric showers. Digital Showers: Using wireless remote controls, digital showers boast the added luxury of controlling one’s personal bathing experience from afar. With the ability to start and customize the flow of water remotely, this allows users to program their shower into a “warm-up” mode so that upon entry, the perfect temperature is already established. Digital showers are a cutting edge area of development in which Versaw foresees ongoing experimentation and technological advancement. In due time, Versaw predicts that digital showers will be automatically paired with smartphones and alarm clocks. ADA Compliant Showers: An ADA compliant shower can be either a wheelchair roll-in shower or a transfer shower; both types must feature a 36 by 36-inch clearance area. For more information, see Bobrick’s Planning Guide for Accessible Restrooms. Whirlpool Bathtubs: Whirlpool bathtubs use high-powered water jets to create an invigorating hydro-massage. Most models offer the ability to mix air into the pressurized water as it releases from the jets, which reduces the potentially harsh impact of the water. Air Bathtubs: Air bathtubs offer a more gentle experience than high-powered water jets. Tiny warm air bubbles are released from small holes at the bottom and sides of the tub. This results in a quiet, relaxing, self-draining and easy to clean tub. View American Standard’s massage bathtubs here. Pressure-Balance Valve: A pressure-balance valve features a single handle, which controls both volume of water and temperature. The most common issue that arises with pressure-balance valves is that the mechanism itself does not pay attention to water temperature. This means that when someone flushes the toilet, plunging into the building’s cold water source, the shower’s flow may become scolding hot. Thermostatic Valve: In contrast, thermostatic valves have two handles; one controls the volume of water while the other controls water temperature. Using a thermostatic valve, the user is able to change the flow volume without affecting the temperature, which makes water conservation much easier. It also means that the user has direct control over the output temperature. In addition, thermostatic valves feature a wax element that expands and contracts in reaction to heat. When water exceeds the maximum set temperature, the wax element expands to reduce the flow of hot water, allowing an increased amount of cold water to mix in. Acrylic: According to Cressman, acrylic tubs make up approximately 50% of the tub installations that Lixil works on. Acrylic bathtubs have a smooth, non-porous surface, making them easy to clean and maintain. The material is naturally warm to the touch, which means that they keep water warm longer than some other common bathtub materials. Other popular materials for bathtubs and showers include solid surface materials, wood, ceramic tile, stone and marble, as pictured above. If you are interested in integrating a bath or shower with a special finish into your next design, speak to manufacturers early on in the design process. Addressing privacy, light and materials, outdoor showers combine many small details to form spaces to clean off and reset. Often designed with an adjacent pool, ocean or lake in mind, they are usually connected to the landscape while providing easy access to interior spaces. We’ve gathered together some external showers designed to transform the everyday cleansing routine. When designing a bathroom, it is easy to forget that there is more to bathtubs than CAD’s default, 5-foot by 30-inch rectangles which tuck neatly against the wall. Instead, consider specifying a freestanding tub to become the focal point of the room, a sculptural centerpiece to be admired from all sides. This collection features gorgeous, freestanding bathtubs by designers who think outside of the box quite literally, utilizing unconventional materials and imaginative forms to push the boundaries of bathroom design. Find the bathtubs and showers through Architizer’s community marketplace for building-products. Click here to sign up now.